Please note: This integration has to be installed by the Gorgias Admin and will be active for the entire Ottspott team. Once connected to Ottspott please go to the "Integrations" section. Click on the "Expand" button to see how to set this integration. Please go to the Gorgias back office -> Settings -> REST API. Copy the 3 settings: "Base API URL", "Username" and "Password (API Key)" and then paste to the Ottspott back office. Click on the "Connect" button in the Ottspott back office. 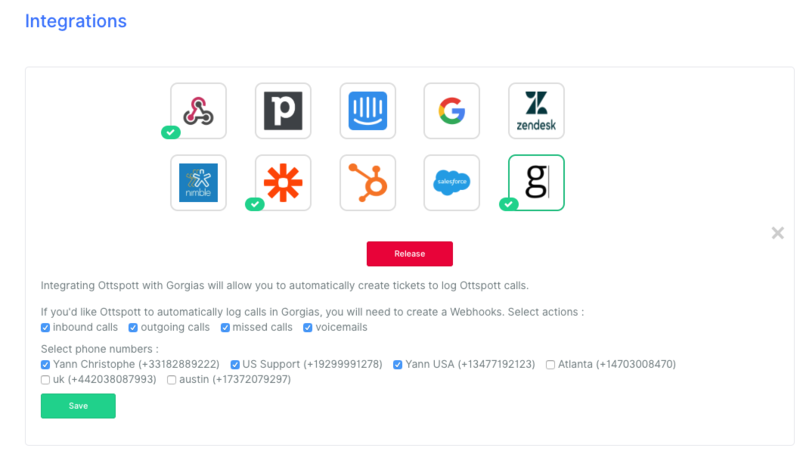 Now you can check each call action and each Ottspott number you would like to create a Ticket inside Gorgias and then click on the "Save" button. How does it look now with Gorgias? Now a ticket will be created for missed calls, voicemails left , outbound as well as inbound calls with the name of your Gorgias contact provided the number is associated with one of the Gorgias contacts. You can also listen to call recordings , listen to voicemails or read voice-mail transcriptions if the voicemail is successfully transcribed by the Ottspott bot.